If this is it, what are we going to do with it? A solo performance. A live animation. Created with a box of objects from around the house. Charlie Morrissey is the artistic director of The Tree of Light... A major new large-scale outdoor performance as part of the Cultural Olympiad with 1,000 performers. A solo based on the work of Etienne- Jules Maray, commissioned by Siobhan Davies and Bob Lokyer. 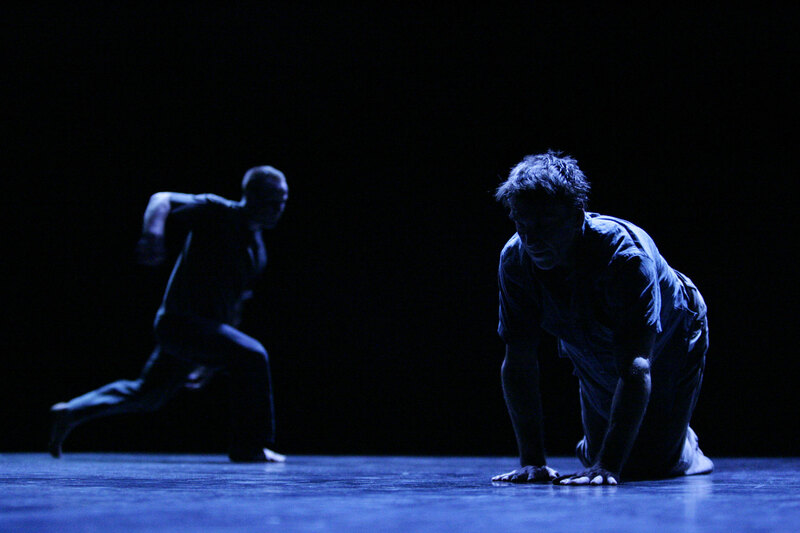 Moving Men is a trio including Jean-Hugues Miredin, Charlie Morrissey and Adrian Russi. They have been coming together since 1997 to research, teach and perform dance and improvisation, and together have taught and performed across Europe. A series of three site-specific performances commissioned by PVA Medialab and the Jurassic Coast World Heritage Site. A site-specific performance created in and around a disused glass house. A group including Kate Brown, K.J.Holmes, Christoph Lechner, Scott Smith, Henry Montes and Charlie Morrissey. Researching improvisation. A participatory sie-specific performance which took place on, in and under the water at Brighton Marina. A research and performance project with dancers including Lindsey Butcher, Charlie Morrissey, Scott Smith and Fin Walker. Performed within an installation created by Rob Hopper. A piece co-directed with Becky Edmunds, and created in China with the Guangdong Modern Dance Company. A performance created in collaboration with sound artist Brian Duffy and video artist/lighting designer John Varah. A performance piece created within an installation of water, wood and ice created by Walter Bailey with a sound score by Kaffe Matthews. A participatory performance created on and in the water at Hove Lagoon. A performance created for the Corn Exchange in Brighton in which the giant ballroom was transformed into an enormous re-imagined bathroom. A site-specific performance created with Becky Edmunds on the beach and in the sea in Brighton.